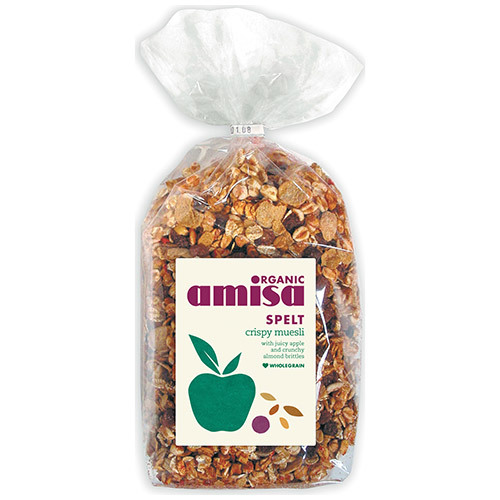 Amisa Organic Spelt Crispy Muesli is made with apples and almond brittles. Excellent as a breakfast food or healthy snack. Whole Grain Spelt Flakes* 49%, Dried fruits* (Sultanas* with Sunflower Oil*, Dates*, Apricots*, Apples* 2%, Raspberries*, Blackberries*), Spelt Flakes* 9% (Wholemeal Spelt Flour*, Raw Cane Sugar*, Corn Malt*, Sea Salt), Spelt Pops* 8% (Spelt*, Honey*), Honey*, Sunflower Seeds*, Almond Brittle* 2% (Toasted Almonds*, Raw Cane Sugar*, Honey*), Coconut Oil*, Rice Flour*, Cinnamon*. Enjoy as a breakfast food or healthy snack. May contain traces of various nuts, soya, sesame and dairy products. Below are reviews of Amisa Organic Spelt Crispy Muesli - 500g - Best before date is 30th June 2019 by bodykind customers. If you have tried this product we'd love to hear what you think so please leave a review.